A couple of weeks ago a friend and I, both members of the Holliday Nature Preserve Association, took a walk into a section of the Holliday Nature Preserve off Newburgh Road north of Warren Road. What we found shocked us beyond belief. 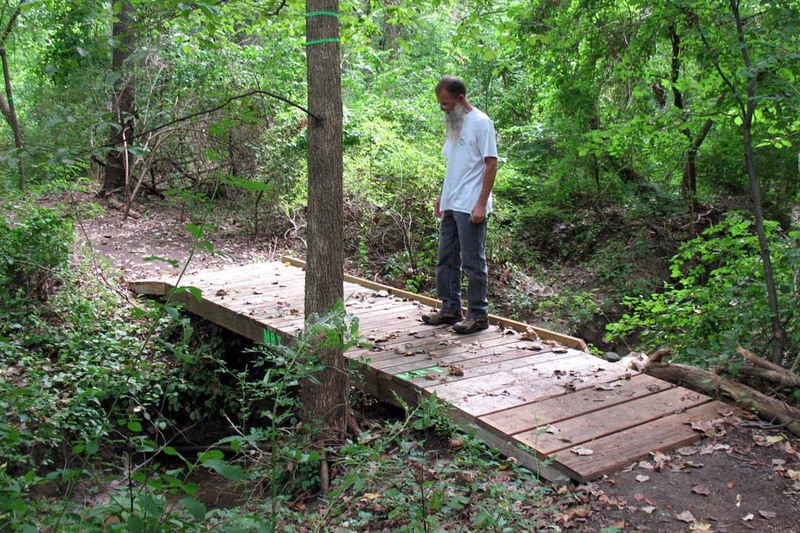 Some group had installed bridges and trails in the Preserve. These were not simple bridges of fallen trees or made by dropping a couple of 2 x 4s between riverbanks by a couple of kids or narrow trails. There were three very solid, bridges consisting of pressurized lumber and very competently installed. The bridges measured 23×4 feet, 16 x 4 feet and 9×4 feet. There was also a trail about four feet wide in spots and nearly a mile long that appeared to be created with an ATV and a riding mower. 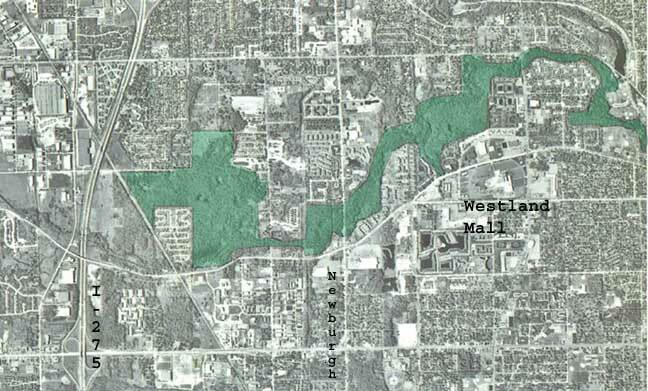 The trail obliterated wildflower areas in spots and even crossed an EPA Supersite that lies in the Preserve. 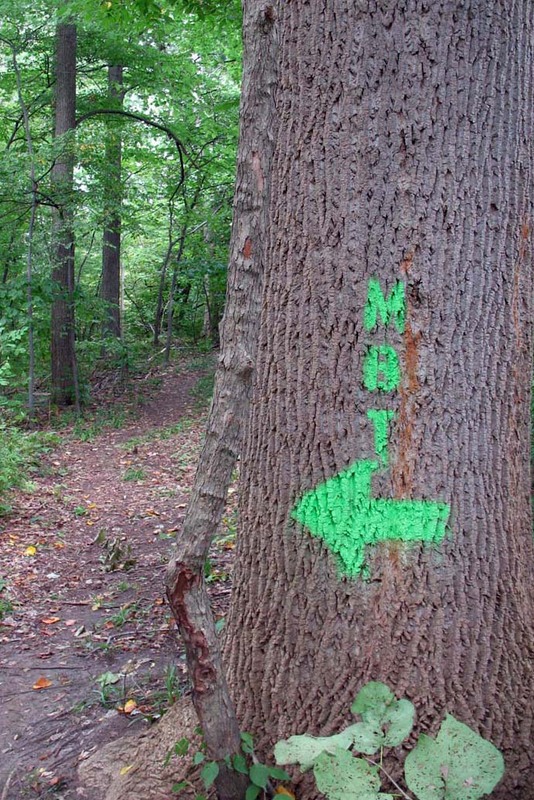 In addition, the letters “MBT” (Mountain Bike Trail?) were stenciled in fluorescent green paint on what seemed every possible surface: board walks installed by volunteers during Rouge Rescue, onto trees, and the bridges. And if that wasn’t enough, to ensure no one got lost, pieces of florescent tape were affixed to tree limbs up and down the trail. No group has claimed responsibility and nothing has appeared on any mountain bike websites as of this point. A rogue group of mountain bikers seems to be the likely culprits since bike tracks were clearly visible and this group has been very vocal in its support of a mountain bike trail in Holliday, even though mountain bikes and motorized vehicles are strictly prohibited. But why this unknown group would go onto public property and build bridges and a trail system is beyond me. The Preserve is not their property and they did not have permission to work in it. As I mentioned in an article on the HNPA website, they wouldn’t dream of going into a Michigan State Park or a regional Metro Park or even a Westland city park without permission to work. So whatever possessed them to think they could do this in a Wayne County Park? Houses, apartments and even businesses back up to the Preserve putting it under intense urban pressure from everything from kids building tree forts to homeowners treating it as their backyard (some have even installed playground equipment or tried to drain wetlands). Mountain bikers are another threat as they enjoy riding up and down the walking trails and even have built small bridges. However, never before has any group gone in and adversely impacted the Preserve in so short a period. And, this time, they apparently went too far because when HNPA reported the work to Wayne County Parks, employees responded quickly, cutting up the bridges and posting signs from the sheriff’s department ordering that no more work take place in the Preserve. HNPA is pleased by the fast response. The question remains of why some group would go to the time and expense (this was a fairly expensive and time-intensive project). Perhaps they felt they were doing EVERYONE a favor by extending the trail system and building bridge across streams to give the public better access to various sections of the Preserve. If they did, they were very wrong. In fact, they may have done all mountain bikers and even groups like the Michigan Mountain Bikers Association a disfavor by their arrogance. And why aren’t mountain bikes allowed in the Holliday Nature Preserve? That’s a subject for another blog and for our next HNPA newsletter.